Teachers, family members with kids in schools, and all people interested in literacy and learning: This one is for you. Krashen, Stephen D., Lee, Sy-Ying, & Lao, Christy. (2018). Teachers, many of you know about Krashen’s comprehensible input (CI) for language acquisition. The idea is that if we make our teaching MEANINGFUL, people will acquire language. Well, CI just got a lot bigger, with the advent of compelling comprehensible (CCI), which deepens CI from language acquisition, to literacy, to motivation, to teaching and learning for a future, which is, of course, unknown. At the very beginning of the book, the authors write that if we happened to be too busy to read the entire little 7 chapter, 87 page book, we really only need to read the first 3 tiny paragraphs–here they are. I disagree with the authors. You also really need to find time to read the Conclusion where the authors share tight little summaries and implications of the new knowledge for literacy, language acquisition, motivation, and well, the future of education. However, you must read to the end of my review so you can find the story of the people I met on the plane while I was writing this review. Or, you really could skip my review and jump down to the bottom and read the story of The HORSE and HIS BOY (1954) by C.S. Lewis. Before we begin, you need to know that I have been a Krashen fan since the late 1970s, when I went to hear him speak at a conference in Phoenix. He turned my grammar-loving, memory-centered teaching up-side-down. Before his presentation, I really believed that “I will teach, and they will learn” the conjugations, the past perfect tense, the little direct and indirect pronouns, and the simbolismo de Don Quijote. Turns out that those teenagers in AZ needed to use real language in real contexts to acquire Spanish. In addition, most of the students had been using Spanish at home, since they were born, so I am forever grateful to them for helping me acquire Spanish, too. Soon after this great discovery about the use of real Spanish, the principal moved our classes way out on the edge of the campus in a room, which had previously been used for shop classes. The band was moved into the only room near us. Worked perfectly. Our lively classes didn’t bother any of the quieter classes. I think I thank you, Steve. Previously, I have published on this experience with The Benson Kids, and I will post a link at the bottom of this post. My only problem in reading and writing the review of this book is that I kept getting lost in the flow (Thank you, Csikszentmihalyi, 1990) as I forget all else and relished the memories of my teaching experiences which kept flooding back. I cannot promise you an archetypal book review, but rather I will share HOW I read it and WHAT I thought, as I read. First, I did a fast scan of the book, as I know most of the research and implications in the book, and I wanted to know what’s new? A-ha: Something very new indeed, as comprehensible input (CI) just grew and deepen to include compelling comprehensible input (CCI). I promise to explain, as we go. Or as the authors say early in their book: “We will do our best” (p. ix). Second, after scanning the book, I went immediately to the References, to find our ‘ol literacy friends: Our Keeper of the Numbers and Knowledge, Berliner; The Book Whisperer, Donalyn Miller; Our Intellectual Hero, Chomsky; Mr. Flow Himself, Csikszentmihalyi; Phonics Only Helps Kids Do Better On Tests Of Words In Isolation and Not Comprehension, Garan; Story-telling Guru, Mason; Words In Context Matter, Nagy; Ever The Researcher, McQuillan, Dear Friend, Fay Shin; Beloved, Frank Smith; Mr. Read Aloud, Jim Trelease, and many other highly-esteemed literacy scholars. 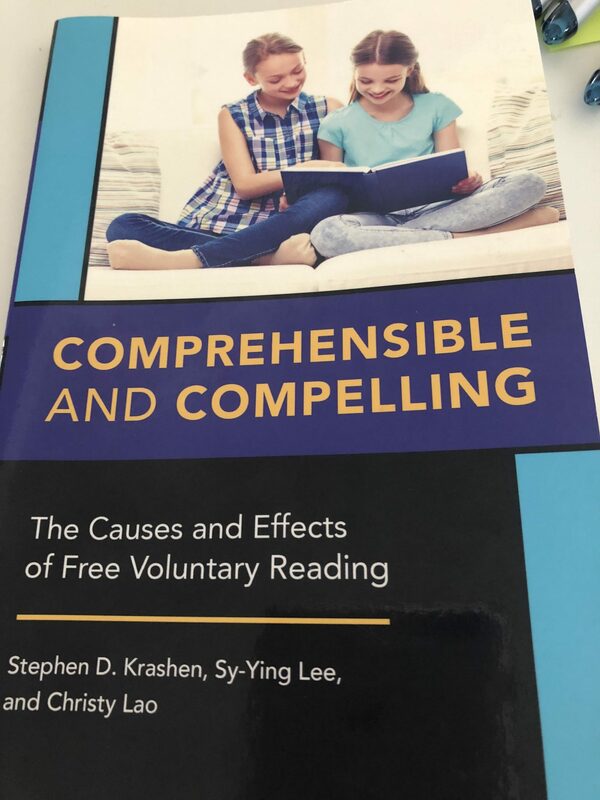 To Bean and her buddies, I say: “Not to worry.” Indeed, the Krashen, Lee, Lao book provide the evidence (Chapter Six) that “readers, when allowed and enabled to select their own reading, do not stick to substandard texts, but rather select more demanding reading material as they mature” (p. 83). Third, after the References, I went right to the Index. I checked Comprehensible Input (Krashen, 2003), p. 2: We acquire language and develop literacy when we understand messages. This is now (2018) referred to as the Comprehension Hypothesis. The opposite is the Skill Building Hypothesis (p. 2) which posits that competence is in the distance future after a whole lot of hard work. It is like the difference between intrinsic and extrinsic learning; between meaning-centered and memory-centered; between incidental and intentional learning; between comprehension and reading skills. Can you see that I am now in the flow (Csikszentmihalyi, 1990), and nothing but this activity matters to me. The concerns of today disappear, and I am lost in this writing. Tonight when I read my novel, I will be lost in that world. 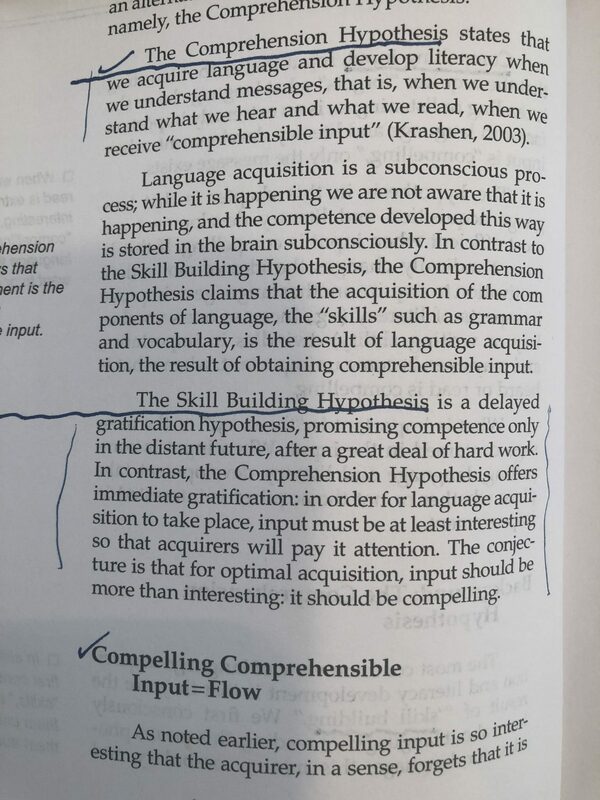 Compelling Comprehensible Input = FLOW, which is where I am right now. We all love to understand, and we all love when something is really, really interesting (OK, compelling) for us, and we all love to get lost in a project (flow). A glance into these 7 short chapters, which Krashen, Lee, and Lao say (with tongue firmly placed in cheek, I hope) we can skip. I found them worth my time. 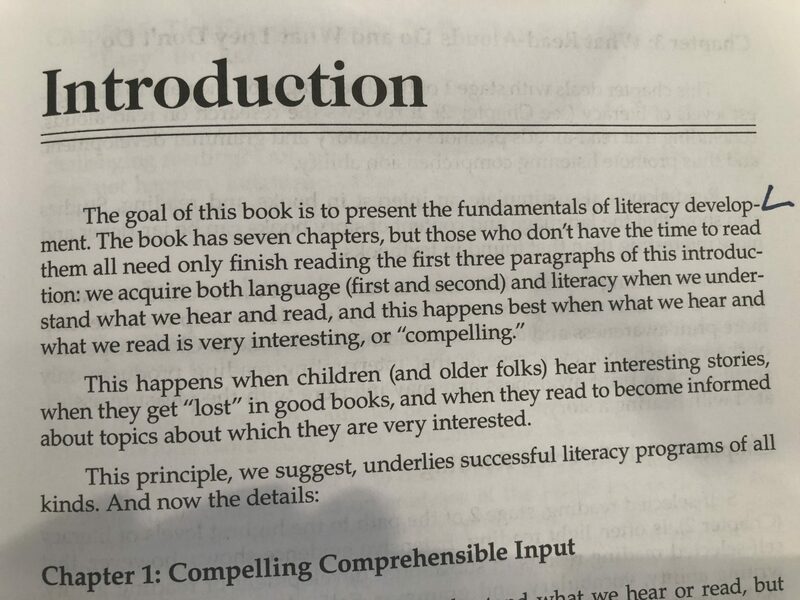 Chapter One Compelling Comprehensible Input–Compelling comprehensible input has primacy in language and literacy development: This is a game changer for education. Read it. Chapter Two, The Three Stages of Reading–If you are skipping any chapters as you read, do not skip this one. Krashen uses his own experience as a case history. Read it. My story is very different, but that is for another WinkWorld. I suspect that I am on out-lier. Chapter Three, What Read-Alouds Do and What They Don’t Do–Read-Alouds are not the be-all-and-end-all for literacy development, but they are highly effective. 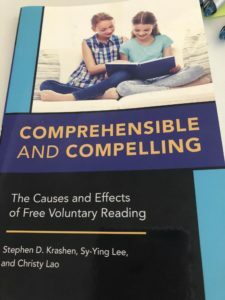 It is not helpful to focus on print awareness, while reading to kids; it just interrupts their connection with the story…and, it can be very annoying for them. Read it. Chapter Four, Self-selected Reading–Apparently, I will not be going to hell-in-a-handbasket because I sometimes choose light reading, which is often held in distain. Last night, I read Ghosted by Rosie Walsh, and apparently I will still be okay. I read hard stuff, too. You and I both like to choose our own reading–kids, too. Read it. Chapter Five, Will They Only Read Junk? Answer: Not to worry. Read it. Chapter Six, The Complexity Study: Do They Only Read “Easy” Books? Here is the evidence. The data demonstrate that children in a print-rich environment, in which they can choose their own books, do not stay with only easy books. In fact, they will begin to choose harder books. I am always reminded of one of my 1970s students, José. I told the class they could choose their own reading and their own writing, and after a little quiet time, 8th grader José, issued the challenge. “Even the Tucson phone book?” Sure. He did not get beyond the A’s, when he moved on to much harder materials. More of this story is found in The Benson Kids, posted at the bottom. Read it and read Krashen, Lee, and Lao’s Chapter Six, too. Chapter Seven, What Have We Learned from PIRLS ? (an international test of reading)–Access to compelling comprehensible input matters. Poverty is the problem. Libraries are the answer. Read it. As I was writing this review on a flight from Chicago to Philadelphia, I suddenly realized that I heard the voice of someone reading aloud. I started searching and found a mom in the middle seat directly in front of me. She was leaning over closer to her teeny-bopper daughter in the window seat, who was leaning into her mom. The mom read aloud the entire trip. When we landed, I immediately asked the mom and daughter what they were reading: The HORSE and HIS BOY. Various versions of this story have been printed in the 4 different edition of Critical Pedagogy: Notes from the Real World. The following story is taken from the 3rd edition (2004).